Today lawmakers are debating Hb 3031 which raises a brand new 1% payroll tax that both the small business and the employees have to pay 50/50. Lawmakers should examine existing state grants to businesses before raising brand new payroll taxes with HB 3031. Currently, Oregon state government is giving our tax dollars to private businesses for private activities. We could eliminate tax credits for subsidizing Hollywood-style film companies. There is also the Oregon Business Expansion Plan where the state pays big businesses to hire more workers. These funds could be re-invested into a pilot program that awards the most vulnerable businesses payroll help for employees that are leaving for emergency circumstances. These grants could be based solely on the greatest need instead of creating a wide-open door social welfare program available to anyone based on a very wide criteria. Think about it. Business Oregon already gives generous grants to companies that hire more employees. Is it not better to spend the same funds helping Oregon’s smallest and most vulnerable businesses from losing an employee to an emergency than to give away money to big businesses to hire additional employees? For the record, the Taxpayer Association opposes the policy of giving private companies tax dollars to conduct private activities. 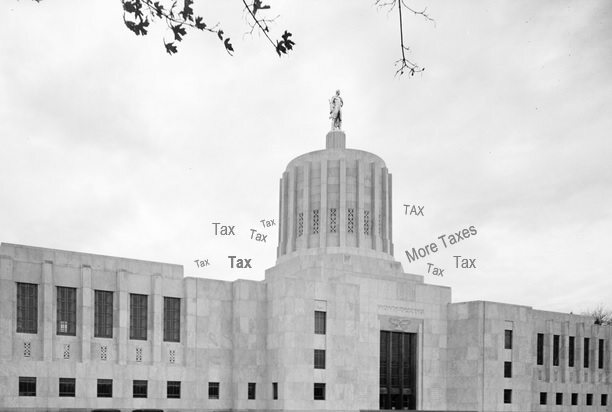 However in light of another painful new tax, it is better for the State to begin eliminating and prioritizing its flawed business hand-out programs than to create another such tax. Read more on HB 3031 here.